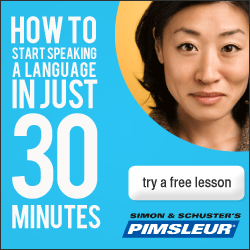 The Pimsleur Method is tried and true, offered in over 50 languages, and is regarded by many as the best way to learn foreign languages fast! It’s a great learning tool to add another language to your arsenal and become bilingual, or trilingual, etc. The product’s own website probably says it best, “the simplest, most effective language course ever developed.” The Pimsleur method is unique and developed with an intentionality called “Graduate Interval Recall”. The courses are sequenced scientifically to help you learn more efficiently. It’s portable. I actually found Lessons 1-6 at the library, and I checked out the CDs and listened to them in the car on my commute. The speed at which the native speakers is easy to follow. I don’t know about you, but some products are hard to use when you’re first learning the language because you can’t make out what the native speakers are saying. This method takes it slow. It let’s you hear a short conversation, and then breaks it apart, bit by bit, so that you get to the place where you can understand and speak the very same exchange. The lessons are short and give you grammar, vocabulary and usage ideas. Subsequent lessons not only build on each other but go back and review earlier vocabulary to assure that it has moved from your short term memory to your long term memory. You don’t spend a lot of time on rules. You jump right in to conversation and learn the rules as you go. It’s much less overwhelming that way – you can almost forget you’re learning a rule! You focus on conversations right away. I’m not sure what to put for CONS, but here are a few thoughts. For a fast learner, this product may be a little frustrating because so much time is spent with each exchange. If you are a visual learner, you are only listening and repeating and not seeing the actual words. Those that want to learn to speak another language in a short amount of time. While you may not be fluent, the words and phrases taught in these lessons give you a very strong base on which to build future language learning. Each CD has two lesson sessions that last about 30 minutes each. By hearing and interacting with native speakers, both male and female, you can gain great insight to the vocabulary differences that exist between the sexes. If you are a male, you’ll be able to hear the way you would say a particular phrase, as opposed to how you would hear a female say the same thing. That can be helpful in an actual conversation and show your understanding of the differences and nuances of the new language you are acquiring. If you have questions, there is a toll-free number on the official website. Other than that, I am not certain what is available in this regard. The price varies depending on the option you select. CDs cost more than the downloadable Mp3s. The software option adds 300 flashcards and 300 matches per level. Each Level (30 lessons) is $345 for CDs, $150 for software, and $119.95 for digital download. All levels have 30 lessons each. If you were to purchase all five levels in a bundle – that is the best value – it would be $1190 for CDs and $550.00 for digital. You can do the math! Note: Specials are periodically advertised on the website. The Pimsleur Method looks to be very complete and easy to use. However, it is also somewhat pricey. Because it’s so portable, you can take lessons on your computer, through any iOS or Android device, or purchase the CDs. You can listen in when it’s convenient for you – doing chores, driving to work, walking the dog – just 30 minutes per day! At least take a moment to check out the free trial below! Having and learning a new language is great right off the bat, specially if you’re trying to make business. I find it great that it exists a method that can help you learn a language as fast as you can, but I find it a bit expensive. It’s great to learn languages, but for that price, this method is out of reach for many persons. That is really the primary downside to the Pimsleur method. It’s a great method and Dana is continuing to use it to learn Spanish. There are several other choices that are not nearly so expensive. Check out this article for some of the best. Find the method that fits best for you, your lifestyle, and your budget. Hi Dana: I am in the process of learning more Italian so I can interact better with the beautiful people of Italy next time I’m fortunate enough to be able to travel there again. I have been using Rosetta Stone and find it helpful because it is a visual tool. I’m thinking that adding on this pimsleur method to make good use of the many hours I spend in my car would help my progress. Do you think that combining these two methods would be helpful or confusing? I’m confident it would be helpful. I like visual tools as well, but really like making use of my time commuting by using Pimsleur. I can see the two methods as being quite complimentary. I really enjoy the Pimsleur method. I’ve been using it on my daily commute to and from work and have been making great progress. I definitely encourage you to give it a try! This sounds like a good product. There seem to be so many ways to learn a new language these days. This seems like a good one because the speed of the native speaker is slower. That would be helpful for me. Also the fact that it is available in 50 different languages! That’s great. Too bad you don’t get to see the actual words though, that might be a bit tough just to hear it. Dana and I both love the Pimsleur method; I hope you’ll give it a try. What language are you interested in? Great! Both Cantonese and Russian are among the 50+ languages offered using the Pimsleur Method! You do get to see words with Pimsleur, but after the conversational training lessons. All courses come with a reading component. Correct. Pimsleur is primarily a conversational (speaking & listening) course, but each level does also provide a booklet which provides a reading component. Very thorough review. I am currently living in South Korea and trying to learn the language just by full immersion. I know there are a lot of different language programs out there and I’ve looked into a few of them but for the most part, I’ve just been kind of getting by. I think I’ll give this one a try based on your review. Thanks for the good information! I’m glad you found the review thorough and helpful! Pimsleur is certainly an excellent product; Dana and I have found it very helpful. I fully expect you will also.